with Galerie Sedelmeyer, Paris (according to a red seal on reverse). Sorgh specialised in depicting peasant interiors stylistically indebted to the work of Adriaen Brouwer, and David Teniers II under whom, according to Houbraken, he trained in Antwerp. 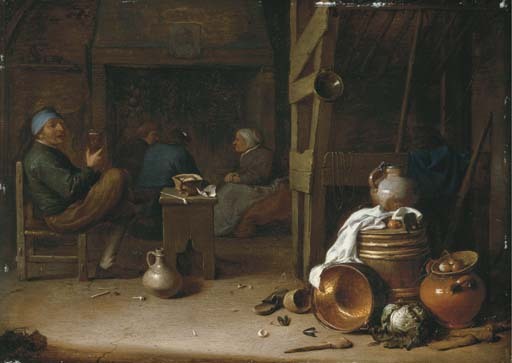 The present picture recalls many such scenes painted by Teniers in the 1630s, particularly in the execution of the figures, and also in the rendition of the detail - found the deft examination of the different surface textures of the barrel, copper pot and clay urn still-life in the foreground. Houbraken relates that Sorgh also studied under Willem Buytewech but his work shows no real connection with the Antwerp artist who in any case died in 1624 when Sorgh was in his teens. Sorgh is recorded back in Rotterdam in 1630, he married there in 1633 and in 1637 bough an expensive house on the Steiger. He remained in Rotterdam for the rest of his life.